Since I haven’t posted here before, I’d like to introduce myself. My name is Kyle Willett, and I’m a postdoc working at the University of Minnesota in Lucy Fortson’s group. My work for Galaxy Zoo includes development of the next generation of tools that Zooites can use to explore galaxies and conduct their own research. My own scientific focus is on high-energy active galaxies, for which our group is using Sloan and Galaxy Zoo data to try and quantify the environmental properties. This system is scientifically interesting for several reasons. While merging galaxies are common throughout the universe, the merging process is relatively quick compared to the total lifetime of a galaxy. Catching a system with long tails and multiple companions is rarer, and gives us the chance to match our models of galaxy interaction against a system “caught in the act”. This is one of the main drivers of Merger Zoo, and a system like this is a good test to see if we can reproduce the tidal features. If so, then we can start to think about the bigger picture, and predict how often you’d expect a multi-galaxy merger like this to occur. 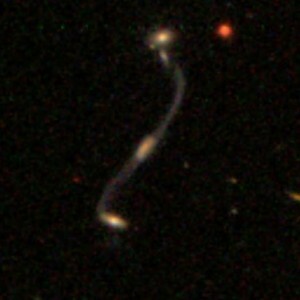 We’re also interested in the gas and stellar content of the galaxies and their tails. In most merging systems, gas in the galaxies is gravitationally compressed, which leads to a burst of new star formation in the galaxies and their tails. Since this results in more young and hot stars, the colors of these galaxies are typically blue in the Sloan bands. However, all four galaxies and the tidal tails in this system are red. If that’s the case, then we want to estimate the current age of the system. Were the galaxies all red ellipticals to begin with, with very little gas that could form new stars? Or has the starburst already come and gone – and if so, how long-lived are these tidal tails going to be? After Bruno’s discovery, the team started by looking at what other archived observations could tell us. An ultraviolet image from the GALEX satellite showed no strong UV source in the system. Radio observations showed a point source in the system that might be consistent with weak star formation. This convinced us that we needed an optical spectrum of the system. Spectra give several crucial pieces of information – first, by measuring redshifts we can determine an accurate distance. This tells us whether all four galaxies genuinely belong to a single interacting group, or whether some appear in projection. Knowing the distance, we can also use the UV and radio flux measurements as diagnostics of the total star formation rate. Finally, with really accurate spectroscopy, we might be able to measure the kinematics of the galaxies, and measure the velocities to get a 3-D picture of how the four members are interacting. Since Sloan doesn’t have a spectrum of this system, we needed more observations. Danielle Berg, a graduate student at the University of Minnesota, observed the Violin Clef in September using the 6.5-meter Multiple Mirror Telescope in Arizona and obtained two optical spectra. The analysis has shown that all four galaxies lie at the same redshift (z=0.0956 +- 0.002), and are likely all genuine members of the same group. None of the galaxies show evidence of strong star formation, confirming the red colors that we see in the Sloan data. The next step in the analysis will be working with simulations like the ones in Merger Zoo. Having confirmed that this really is a quadruple merger will significantly constrain the merger models, and hopefully give us well-defined parameters for the age and history of the system. This is a step that Zooites can help with – if you go to http://mergers.galaxyzoo.org/merger_wars, you can identify simulations that resemble the Violin Clef. We need more clicks at this point, so please consider going to Merger Zoo and helping out! We hope that this will result in another scientific publication soon for the Galaxy Zoo team, and it’s been an exciting project to work on.